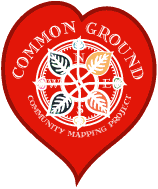 Common Ground held a mapping workshop and Chai and Pie celebration 2-5 PM Friday 16 February 2007. Pre-party Informal Workshop, 2-3:30 PM. Presentation - Maeve, Amy and Charles facilitated a discussion about examples of our past and present Common Ground projects, our cooperation with LifeCycles and our international connections. We hope lots of partners from previous and current visions projects will be on-hand to share their stories. Mapping the Love - We made a new layer of information for the Online Greater Victoria Green Map, and learned how we go from paper maps to the online Wikimap. Web architect Patrick Hayes gave a demo and answered questions. Chai and Pie Party, 4-5 PM. We'll start the Pie and Chai Celebration - Tim Elkin and the rest of the CG board cut the ribbon on the new CG website and talked about our future program plans.